At the Massachusetts General Hospital (MGH), nurses have boldly dared to transform their nursing program into a place where patient care, science, research, and evidence combine for improved practice, responsible economics, enhanced mentoring, and a fertile place to allow extraordinary nurses to develop. Fostering a Research-Intensive Organization addresses how a strong nursing research agenda can impact patient care and influence the redesign of services needed to effectively respond to a changing healthcare environment. This book provides a comprehensive review to support the practice environment as an important place to advance nursing science through research by: providing examples from the MGH experience useful in explaining the importance of a nursing research agenda, discussing the support for and the conduct of research applicable to nurse’s professional and personal development, demonstrating how to design a research infrastructure and the provide the resources, support, and organizational commitment needed to promote research in practice settings, sharing ideas about mentoring, evidence-based practice, methods and evaluation, instrument development, and post-doctoral fellowships and developing new funding sources, partnerships, team-building, and engagement in multidisciplinary research activities. 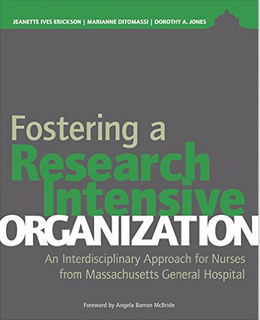 Written and edited by Jeanette Ives Erickson, DNP, RN, NEA-BC, FAAN; Marianne Ditomassi, DNP, MBA, RN; and Dorothy Jones, EdD, RN, FAAN, FNI, the new STTI book, Fostering a Research Intensive Organization: An Interdisciplinary Approach for Nurses from Massachusetts General Hospital, is an informative, educational book filled with valuable resources to guide the development of a research agenda in care delivery. Clinicians with a range of research expertise will find discussions about the support for and the conduct of research applicable to their professional and personal development.